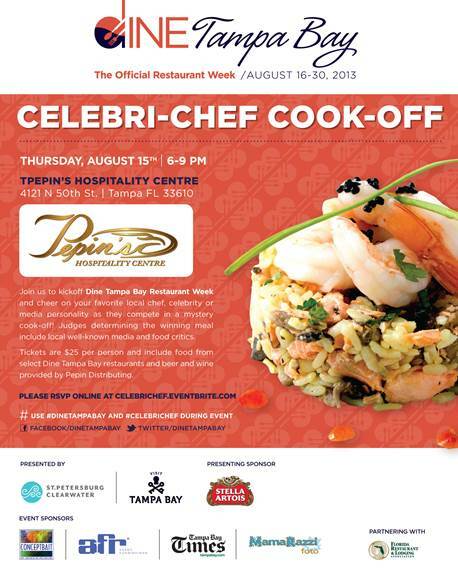 Dine Tampa Bay "Celebri-Chef Kick-Off Cook-Off"
Tomorrow night believe me when I say you DON’T want to miss Dine Tampa Bay Restaurant Week’s signature event, The “Celebri-Chef Kick-Off Cook-Off” at TPepin’s Hospitality Centre. This event will be action packed with Tampa Bay’s top celebrities and media personalities! Dine Tampa Bay Restaurant Week chefs will guide media personalities through a timed cooking challenge with secret ingredients and create a dish for a panel of 5 celebrity judges. The cooking gloves are coming off…. and just like in other year’s, this competition gets heated (no pun intended). Jeffrey Jew, Bravo’s Top Chef Seattle. Ian Beckles, Ron & Ian Show on 620 WDAE. Tickets are only $25 and can be purchased onlineat http://celebrichef.eventbrite.com/ or at the door at the night of the event. The event starts at 6 p.m. this Thursday (Aug. 15) and goes until 9 p.m. Plan to be entertained throughout the night with our “hostest with the mostest”, Mister Jack Harris himself. The cooking challenge starts around 7:15 p.m. Your ticket includes beer and wine donated by Pepin Distributing, Dine Tampa Bay’s presenting sponsor and food samples from event food sponsors: Crabby Bill’s Seafood, The Pub-Tampa, Bon Appetit, AQUA, Irish 31, GrillSmith, Sunset Grill at Little Harbor and Birch & Vine. Dine Tampa Bay Restaurant Week (August 16 through August 30) allows local, regional and national food lovers the opportunity to enjoy a prix-fixe dinner for $25, $35 or $45 per person (excluding beverages, tax and gratuity) at a number of participating fine-dining Tampa Bay restaurants. Dine Tampa Bay’s goal is to position Tampa Bay as one of the top culinary destinations in the nation by increasing awareness of the many amazing dining opportunities available in the region. Ever wondered about that restaurant you thought might be out of your price range? Restaurant Week is your chance to give it a try with the security of knowing exactly what you will be spending.